Youcef Nadarkhani isn't dead; he is alive and very much so. Praise God. So, yeah, feel free to ignore the post and picture (which I believe isn't even Youcef, below). Let's keep his family in prayer. Youcef is with God now... I mean, you can even see the peace on his face; God never left him through all this. Wake up family. Don't sleep on your brothers and sisters being persecuted. Christian Pastor Youcef Nadarkhani has been executed in Iran. He is the pastor who has been imprisoned and found guilty by the courts in Iran of being a Christian. Now he’s been executed in spite of international appeals to spare his life. He was hanged today. Where is the outcry from the White House over the murder of this innocent Christian minister? Where is the outcry from the church in America and around the world? The silence is deafening! 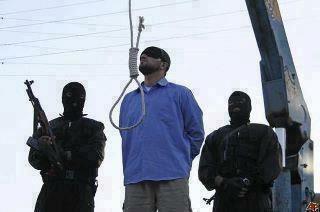 Pastor gets executed in Iran. Where is the phone call from Obama on this one? Where is the outrage from Gloria Allred, Jesse Jackson, Al Sharpeton, and the media? Do you now see the hypocrisy? I don't have to tell you what would happen if we executed a Muslim Cleric in America do I? When you don't cry out for others, then there is no one left to cry out when it happens to you!!! Instead of sharing the latest celebrity outing, trying sharing this on your wall...This makes me sick to my stomach ... please pray for this man and his family!